Fire Cider is a popular traditional herbal remedy freely shared, made, produced and sold by hundreds of herbalists across the world. The remedy has taken on many different amendments over time, somewhat like chicken soup. Many people have their favorite version, but the base consists of fresh garlic, onions, ginger, horseradish and chile peppers that sit in vinegar for the desired amount of time, are strained, and then a bit of something sweet is usually added at the end. The remedy is used to help warm up the body, and generally acts a stimulant and antimicrobial used during cold and flu season. Recently, a large company decided to trademark the name and is forcing small businesses who have made and sold it to change their product names. Some of the companies and individuals in question have made and sold this remedy for many years longer than the company that trademarked it has even existed. Many people feel this is a dangerous precedent to anyone who creates and shares recipes anywhere on the web or in books and this led to a filing with the US Patent and Trademark Office asking that the mark be deemed generic. Until the company agrees to freeing Fire Cider from trademark restriction, a boycott of their product has been launched. 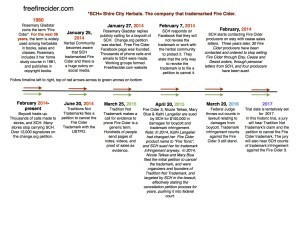 The Free Fire Cider blog is run by herbalists working together with herbalist Rosemary Gladstar, who coined the phrase “fire cider” and started sharing the recipe over 25 years ago, to protect the name Fire Cider from trademarks. We are committed to providing information and materials for the herbal community so that together, we can fight to keep traditional remedies free and available to everyone! The term “Fire Cider” was coined by Rosemary Gladstar. She has published copyrighted books coining the term “fire cider” from the 1990’s, and has freely shared this term since the 1970’s. This term has become a generic herbal term that many herbal companies use when selling their own version of it. This anti-trademark fire cider movement sprang up after a business trademarked the term, “Fire Cider”, bringing to light a bigger issue within the herbal community: trade-marking common herbal terms. The herbal community is now fighting to keep these terms in public use. This is not about Shire City Herbals as individuals or their business, but about defending a generic herbal term and keeping it in public use. Shire City Herbals’ refusal to revoke the trademark on this generic term is not accepted by this community, and we are taking action with an organized response. We have an active change.org petition with over 3000 signatures in the first 48 hours, and now over 10,000. This demonstrates that this term is generic and should not be trademarked. We are actively engaged with the US Trademark Office to cancel the trademark. There is an active boycott, with herbalists/ supporters contacting retailers of Shire City Herbals Fire Cider, and returning their product to the stores. 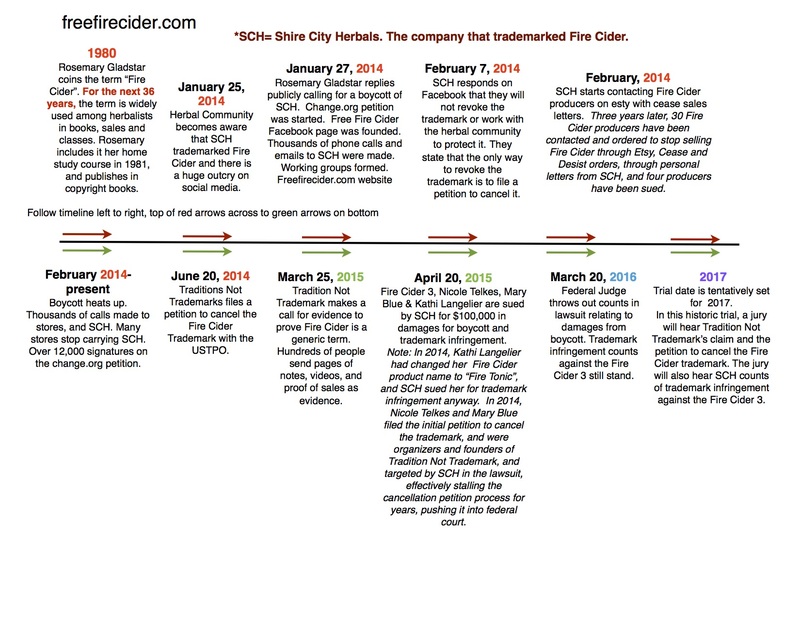 This boycott will end when the term “Fire Cider” is back in public use. This type of action opens the door to the trademarking of traditional medicines for profit. The biggest reason that this is dangerous is because herbs and herbalism have always been widely available to everyone. Trademarking traditional terms will change the herbal market into something that looks more like the pharmaceutical industry, with corporations owning words/terms that were previously accessible to the public. This anti-trademark movement is working towards keeping traditional herbal terms in the hands of small businesses, teachers, and the general public. Through legal measures, a boycott, and a petition, we are working to protect herbalists from being penalized for using terms that have always been in public use.